As I enjoyed the location so much last time I was there, and this past weekend was the end of the season for the Berggasthaus Glattalp, and the weather was forecast to be great, I went back to Bisisthal. Another early start to get the first cable car up to Glattalp, and the same drive there. The weather had completely changed though. The drive through the valley is now full of colour, the contrast of the autumn leaves against the pale rock faces is fascinating! The view from the top was crystal clear. I would have liked a cloud or two for atmosphere, but you can't have everything. Weather like this in October was more than enough. The first shot is one from the cable car station looking towards the Chapel. 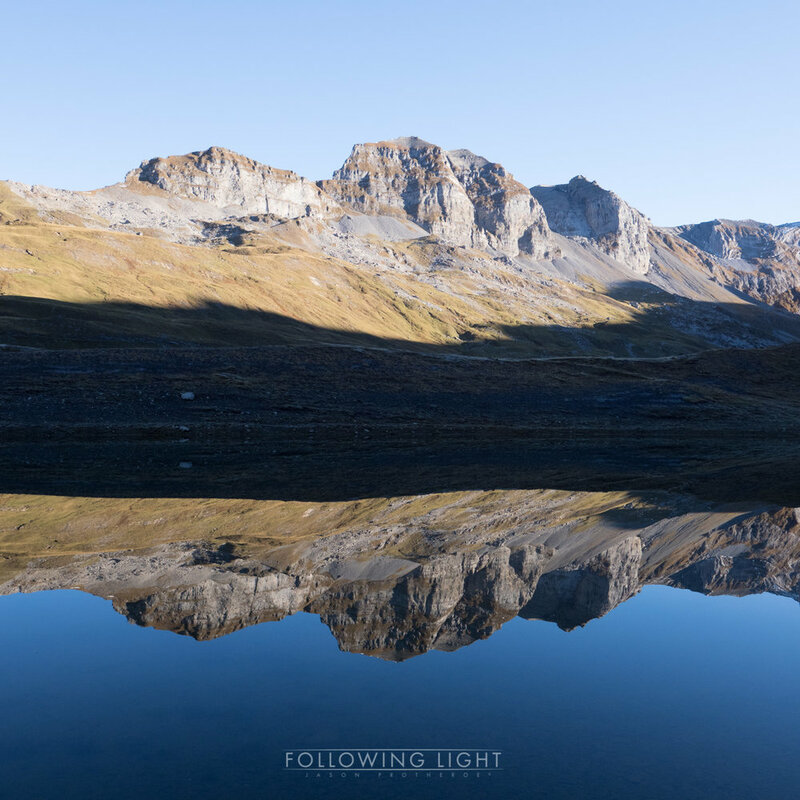 I followed the path back towards the lakes and was confronted by near perfectly still water reflecting the surrounding mountains. The only ripples were from two ducks that, luckily, were just exiting the lake. Most of the morning was spent taking picture after picture and staring in awe at the view. At times it was difficult to tell where the mountains finished and the water started. The reflections of the mountains in the water sometimes appeared clearer than the actual mountains. The contrast present in the mountains slopes from the rock faces and remaining snow fits so well to black and white images. I'm not sure exactly what happened next, but I think that I hadn't completely tightened one of the legs on the tripod. Just as I turned away I noticed a movement in the corner of my eye and turned back to see the beginning of a long slow tortuous fall. I watched in slow motion as the camera fell a long curve. I tried to make a grasp for one of the tripod legs, but I was too late. I closed my eyes in dread as the camera smashed on to the rocks and listened to the sharp crack as it hit. I imagined opening my eyes to see pieces of camera and lens shattered across the ground. When I did dare to take a look everything appeared to still be in one piece. This wasn't quite the case, but the damage wasn't as bad as I'd visualised it. It was still bad, but I was still able to use it to a certain extent for the rest of the two day trip. It will be in for repair, if it can be repaired as soon as possible. The lens, a M.ZUIKO DIGITAL ED 7-14mm 1:2:8 PRO, has a deep dent in the focusing ring. It now grinds and scratches with a sound that feels like fingernails scratching down a blackboard when it's turned. I have absolutely no idea how the glass survived. The body, an OM-D E-M1 Mark II, is the worse part. The base cracked and opened up from the front just below and to the right of the lens bayonet to back diagonally across the line of the tripod plate screw and into the grip connector points. The force of the fall had tried to rip the camera from tripod plate. The plate is apparently made of stronger stuff than the base of the camera. I can no longer connect it directly to the tripod, but I could connect it via the foot plate with the 40-150mm f/2.8 and the 300mm f/4. I'm simply amazed that I was still able to take pictures for the next two days. It speaks very strongly to the build quality of Olympus. This shot to the right was taken upon impact! The next image was taken with the M.ZUIKO DIGITAL ED 7-14mm 1:2:8 PRO after the incident. The image is still clear and sharp, but the noise that it makes while turning the focus ring sends shivers down my spine. I thought that it would be safer to stick with another lens as much as possible for the rest of the day, so I switched to a 12-40mm f/2.8. A rare one of me from the other side on the lens. Even with the views and the weather, my appetite for taking pictures had been subdued by the camera falling incident, and I didn't take many pictures for the rest of the day. 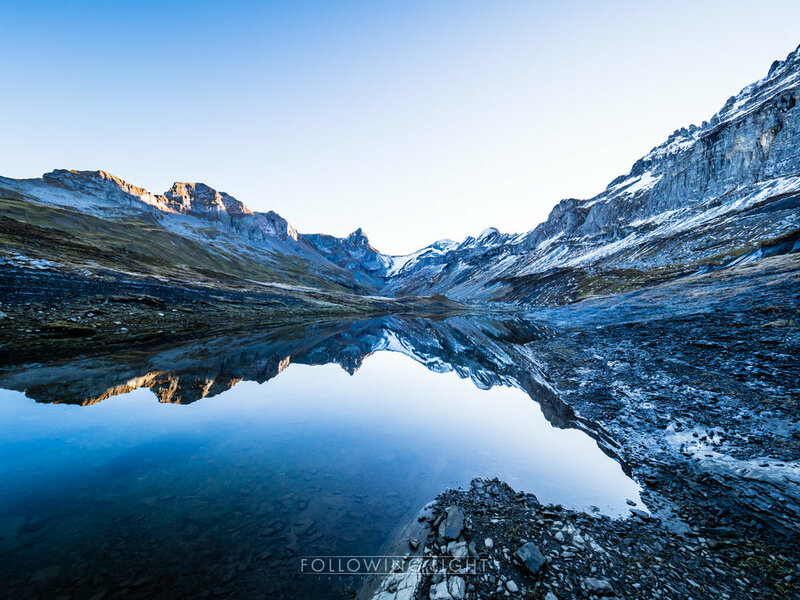 This final image was taken while heading towards Berggasthaus Glattalp for dinner and a night of rest.